Those who follow this issue already know the outcome of the raucous meeting held at the headquarters of the South Coast Air Quality Management District headquarters in Diamond Bar. It was covered extensively in both print, online and electronic media last night. Here's my summary of events based on the coverage provided by our local media friends. The facts of the event are pretty constant among the various reports. The short version of the outcome is that the SCAQMD Board, led by Chairman William Burke, who voted with the majority for a thin 7-6 margin to modify their rule 444 and place new restrictions on nearly 800 fire pits throughout the southland. It establishes a 700-foot buffer zone between beach fires and residences. WILL NEWPORT REMOVE THE FIRE RINGS NOW? According to Jill Cowan's report in the Daily Pilot, HERE, based on the new rules the City of Newport Beach can get rid of 60 fire pits near the Balboa Pier and at Corona del Mar State Beach. Whether they do remains to be seen based on her quote from City Manager Dave Kiff. See more below. JUST A LITTLE OUT OF TOUCH! Cowan provides us with a very interesting quote from Burke. He said, "I understand everybody out there doesn't want this rule. I'm just amazed very few people are here in support of the rule today." This, during a packed-house meeting at which more than four dozen people addressed the directors on this issue. Cowan also quoted Costa Mesa Mayor Jim Righeimer as saying, "These beaches are regional. If you're up and down the 55 you don't go to Huntington Beach." 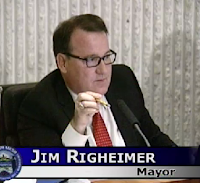 Since the beginning of this issue I've found it fascinating that Righeimer decided to spit directly in the eye of the Newport Beach city council. 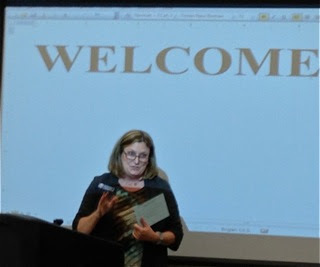 According to Amy Senk, publisher of the outstanding local blog, Corona del Mar Today, HERE, only councilwoman Leslie Daigle attended the meeting and spoke. 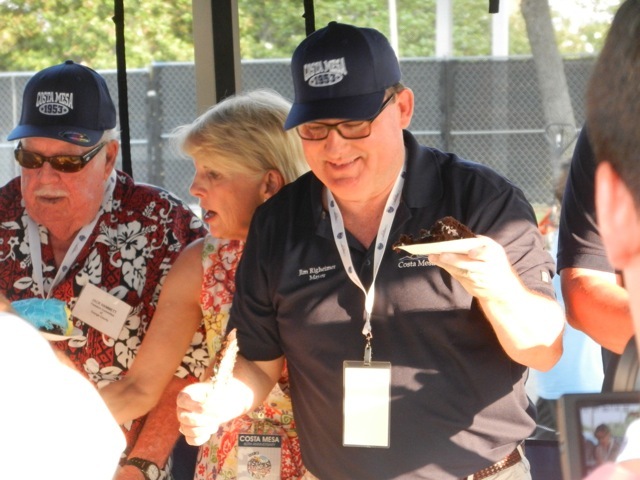 It's curious that others from the Newport Beach council, including Mayor Keith Curry, chose not to attend since it was their petition to the Coastal Commission that started this whole controversy in the first place. According to Senk, of the 49 speakers today, only 7 supported the changes that were eventually approved. The remainder, including 17 public officials or their spokespersons, were in favor of keeping the bonfires without changes in the rules. 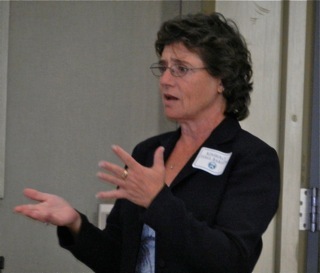 She quotes Orange County Supervisor Shawn Nelson, a member of the Board, as indicating that the "fire rings didn't pose enough of a health risk to warrant the AQMD's attention." He went on to say that Newport Beach, has, "one of the cleanest environments our basin has to offer." Senk tells us that "the board members supporting the rule changes were Burke, Clark Parker, Judith Mitchell, Dennis Yates, Michael Cacciotti, Gonzales and Joseph Lyou. The board members who voted no were John Benoit, Ben Benoit, Pulido, Jan Perry, Michael Antonovich and Nelson." Former Daily Pilot reporter, Deep Bharath, now writing for the Orange County Register in an article tucked firmly behind their pay wall, HERE, quoted Righeimer stating, "They started this mess and they're not even here," he said of the other Newport Beach council members. "They get what they want. This is about multi-millionaires who don't want others there. They know that if you can make it about health, you can shut it down." Obviously, Righeimer doesn't much care what the heavily-Republican electorate and leadership of Newport Beach thinks on this issue. But, before the few people who theoretically "won" yesterday get too cocky, Kiff and Mayor Pro Tem Rush Hill posted an entry on the City website late this afternoon, HERE, that implies much work still needs to be done in that city before this issue is resolved. Kiff's final paragraph says it best - "This issue has been debated extensively in the community in recent weeks and months, and good people are on each side of the issue. I know that the Council will work closely with the community to determine the best way for Newport Beach to move forward. The next chapter is not yet written." Amy Senk posted a followup entry to this issue today, Saturday, HERE. 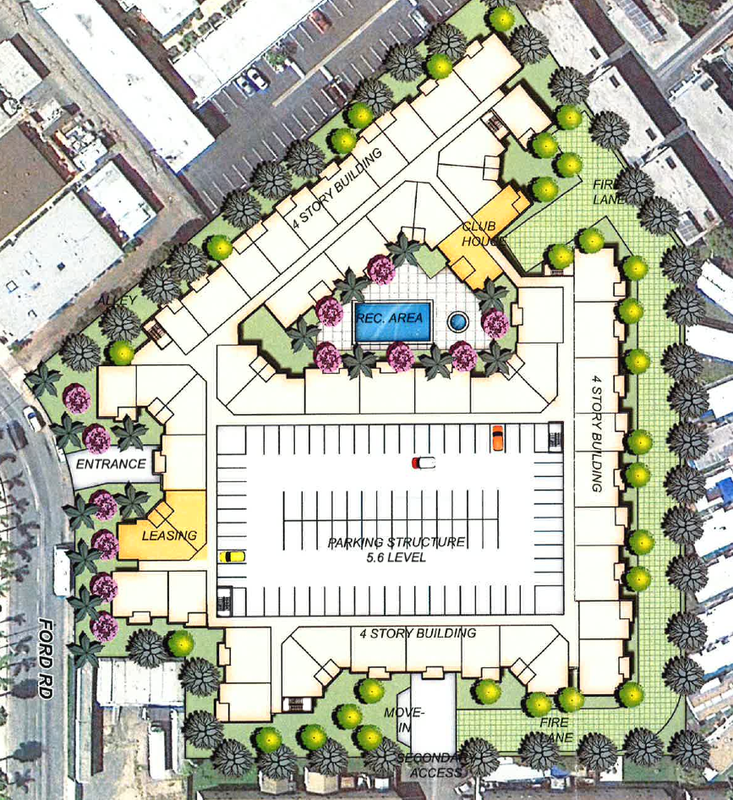 The agenda for the Costa Mesa City Council meeting Tuesday, July 16th, was posted today. Not surprisingly, since it's "summertime and the livin' is easy", the agenda is a short one. That doesn't mean there are not some interesting items for your consideration. You can read the entire agenda HERE. The council has already agreed to cancel the second meeting in August, anticipating diminished activity and vacations. So, between now and Labor Day there will be this meeting and one more, on August 6th, three weeks from now. 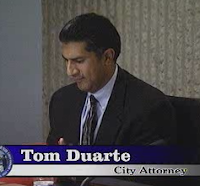 COIN: Ex Parte Communications pursuant to Municipal Code Section 2-238 (b)"
This is the section where contract City Attorney Tom Duarte will, if appropriate for each meeting, "read out" information about any ex parte communications held by council members regarding labor negotiations. It will be very interesting to see how Mayor Pro Tem Steve Mensinger's COIN scheme plays out. It certainly will not streamline the negotiation process. ARE WE EVER GOING TO BEGIN NEGOTIATIONS? As an aside, the contract with the Costa Mesa City Employees Association (CMCEA) expired in March and, to my knowledge, NO negotiations have yet taken place. A quarter of the year has passed and the two parties have not met yet. Seems curious, doesn't it? MORE LIQUOR LICENSES - REALLY? The Consent Calendar has eight (8) items on it, some of which are particularly interesting. The first one, the Reading Folder, includes four items involving liquor licenses - two new ones and two transfers. In a city which has police officers issuing hundreds of DUI tickets each year, it always makes me wonder if so many places where you can legally buy booze is good for the city. Item #3 is Warrant 2480, HERE, which includes a payment of $131,127.84 to Jones and Mayer for legal services. That meter just keeps spinnin'! Item #6 is the extension of the refuse contract for Ware Disposal to pick up trash from municipal facilities. You can read the staff report HERE, which includes links to the list of submissions by other haulers. The second place finisher is CR&R, the carrier who provides municipal trash pick up via the Costa Mesa Sanitary District. Someone may wish to check the campaign contribution lists of certain council members to see if the name "Ware" appears... just sayin'. The only Public Hearing on the agenda is request by staff to approve certification of special assessments for delinquent civil fines for municipal code violations, HERE. Included is a list of the delinquent fines to be considered, HERE. This could be interesting because folks on the list may choose to address the council on the fines. They may NOT challenge the original citation. 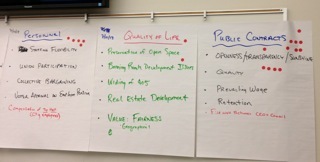 There are two New Business items on the agenda. 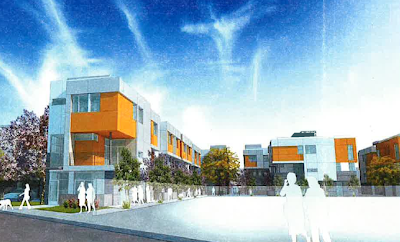 The first, HERE, is a General Plan Screening Request for a 29-unit live/work development on the Westside. The second one, HERE, is a General Plan Screening request for 208 apartment units on Newport Boulevard near Ford Road. I'm going to be interested to hear the discussion on both of these items, since the rental units on Ford Road has seven times the units as the "owner occupied" units in the previous item. Our public officials continue to bemoan the "imbalance" of renters vs. owners in our city - 60- 40% - but continue to approve rental units in disproportionate numbers. Have a great weekend. 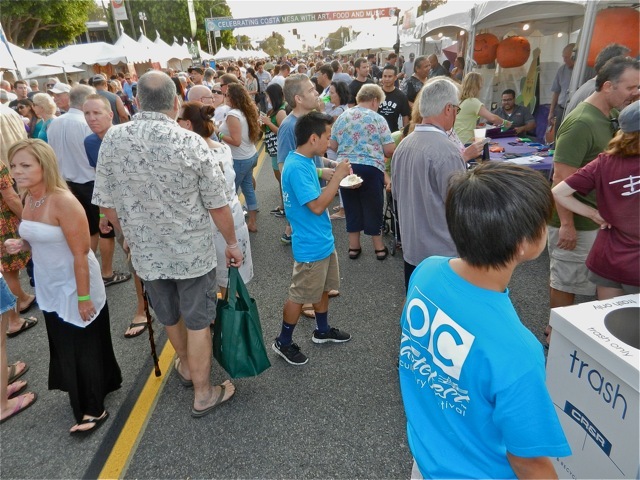 Join thousands of your fellow Orange Countians at the Orange County Fair. 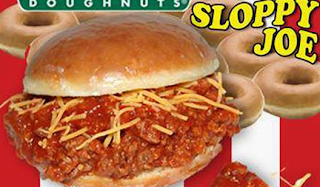 Enjoy one of those Krispy Kreme Sloppy Joes or a deep-fried bacon-wrapped pickle. Oh, yum! Just in case you've been dozing for the past few weeks and missed the media blitz about the opening of the Orange County Fair today, I thought I'd give you some information about that month-long event to chew on. You can read more details in Jeremiah Dobruck's piece from the Daily Pilot, HERE. The Fair opens today at noon with free admission and parking for the first hour. That's a BIG deal all by itself. 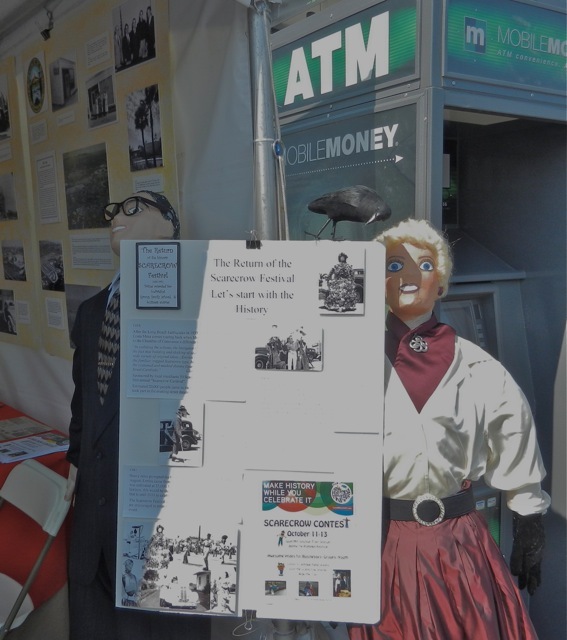 You can read the details about this year's Fair HERE. It will run from today, July 12th, through August 11th and is dark on Mondays and Tuesdays each week. If the $11 admission and $10 parking gives you the shivers, they have MANY promotions that will get you in on the cheap. Read all about them HERE. For example, every Saturday and Sunday from 10-11 a.m. you can take advantage of the "Rise and Shine" deal - a $3 admission! Check out the page for many other deals. So, plan to join the more than 1 million visitors to the Fair this year. There's fun for everyone. See you there. 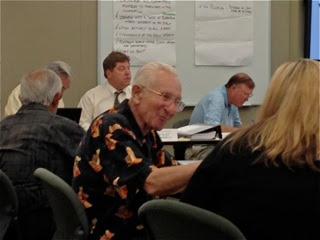 Thursday evening the Costa Mesa 60th Anniversary Celebration Committee, chaired by Mike Scheafer, held a meeting to discuss the recent 3-day event that was held the end of June. However, City Chief Executive Officer Tom Hatch hijacked the meeting to present awards and mementos to the committee members present in honor of their good works on that celebration. It was an unanticipated part of the meeting, but a very nice though. Hatch also mentioned that the City Council will also wish to have a more formal recognition at a future date. And, later in the meeting, Scheafer mentioned that he hopes all hands can make it to the Concerts In The Park on Tuesday, July 30th, when the committee members will be honored. This meeting, held in council chambers, was an opportunity for committee members to take a deep breath and provide a quick summary of their opinions of the celebrations. Segments receiving high praise were the Art Walk, the food vendors, the car show and the great variety of things - something for everyone. A questionnaire will be distributed to them, and to vendors and others involved to provide more formal feedback. Scheafer asked each member present to present to the city staff a brief summary of what they thought the pros and cons were of the event, and to have it to the staff within 10 days. The next meeting of the group will be on August 8th, at which time it is anticipated that all the financials will be sorted out and made available. Bradley Zint of the Daily Pilot was present and published his version of this meeting, HERE. He mentions some negative issues - some that did not get thoroughly fleshed out. I did see a couple committee members leave abruptly when it was clear they were not going to be able to vent about issues important to them at that time. It's my understanding that there will be an opportunity to provide a thorough analysis of the event in the near future. I hope they will return to add their views to the mix. Yes, I'm quoted in Zint's piece and, yes, I did mumble those words - and more, too. I told the group that my wife and I had a great time during our visit to the celebration, and that I didn't see a single unhappy person over the six or so hours we spent there. The entire committee and their leadership, plus Dan Joyce and Christine Cordon of the city staff, should be commended for pulling off an outstanding event in such a short time. Kudos to all. 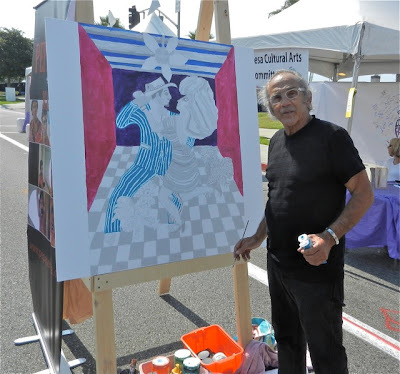 On July 26th there will be a symphony at the Segerstrom Center. On the 30th the Concerts In The Park mentioned above. July 31st is Costa Mesa night at the Orange County Fair, which opens today. On August 3rd it's Costa Mesa night at Anaheim Stadium and also Mike Trout jersey night. Plenty of tickets are still available for that game through Christine Cordon at City Hall at 714-754-5121. In October there will be a scarecrow event throughout the city, which should be a lot of fun. More on that later. 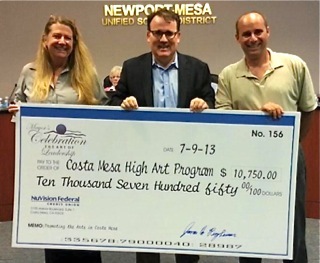 In a press release yesterday the City of Costa Mesa announced that $31,500 will be distributed to two Costa Mesa high school arts programs and PBS SoCal and the Segerstrom Center. This money represents the proceeds from the recent "Mayor's Celebration: The Art of Leadership", held last April. The money will be distributed thus: $10,750 each to Costa Mesa and Estancia high schools for their Arts Programs and $10,000 to PBS SoCal and the Segerstrom Center. 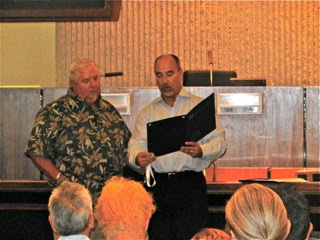 Mayor Jim Righeimer is shown in the photo above handing over the Costa Mesa High School check to Principal Phil D'Agostino with Newport Mesa Unified School Board President Dana Black standing by. Of the dozen members of the public attending the meeting, four, including former councilman Jay Humphrey, addressed the committee during Public Comments. He expressed concern that the committee consider all aspects of the criteria that will be used to evaluate charter options. Robin Leffler said she was going to wait to see what kind of product the committee produces, but that she hopes it will not propose a Charter to the exclusion of all other options. 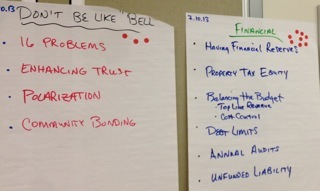 Charles Mooney expressed concern about the City of Bell - a charter city and encouraged the committee first establish requirements before deciding on a charter. The remaining speaker - a grumpy old fella - identified himself as a "simple guy" who was looking for the charter to provide local control. The guy is anything BUT simple, and he left after saying his piece without bothering to see how the process was going to work. Facts are seldom an issue for him. 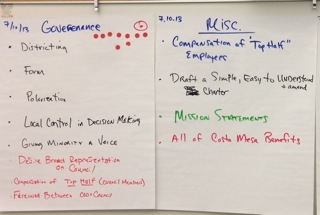 Facilitators Bauermeister and Mike Decker led a discussion on whether the group wanted to elect officers - Chairman, Vice Chairman, Time Keeper - as described in the agenda, HERE. After a few minutes it became clear that most wished to continue awhile longer with the facilitators running the show, and voted to consider the issue again two meetings from now. For now Bauermeister and Decker will provide "facilitation" for the group. The group went through another "Ice Breaker" exercise - they paired-up, spent a few minutes getting to know their partner, then introduced them individually to the group. It worked - the group seemed looser following that little exercise. 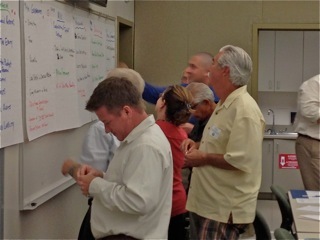 The group generated more than two dozen individual issues they felt should be included as they moved forward. They then winnowed those down by combining those that were, in part, redundant and then used red stickers placed on the sheets with those issues listed to indicate their priorities. The results are shown on the images of those sheets below. As you can see, Public Contracts got the most red stickers and will be the first issue discussed at length beginning at the next meeting on July 24th. This list is NOT the final list, just a start. 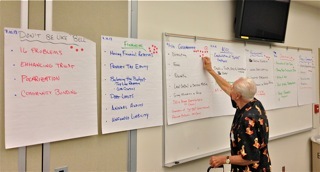 Members were encouraged to think more about it and add items in the future. Of course, the public is always welcome to contribute their thoughts, too, by communicating with the City Clerk, Brenda Green. She is the focus of all communication for the committee. While the group has not yet found themselves lining up on one side or the other on issues, there are some clear indications about how this is going to go. 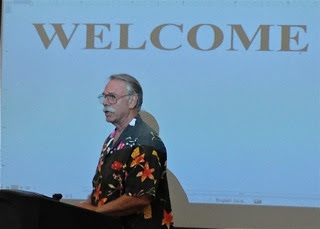 For example, "Tea Party Tom" Pollitt, a loyal follower of Mayor Jim Righeimer and Mayor Pro Tem Steve Mensinger, contributed the need to review "the 15 or 16" problems with the last charter - Jim Righeimer's Charter. It was he who asked to have a copy of that document included in their reference materials along with actual real charters from several other cities. It's likely that he will push to just have that document "fixed" and present it to the council for consideration. We'll see. Later he pushed for a specific timeline for the process, but the group reminded him the objective was to produce a proper document. Hank Panian, the senior member of the group and the only one who has gone through this process before several decades ago, emphasized something he's told the group before - that "this is arduous, difficult, complex work and there's no way to predict how long it's going to take." 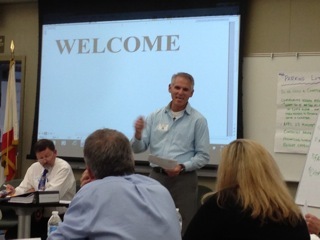 Bauermeister told the group that the council wanted to measure their progress in 6 months. Pollitt made me smile when he referred to "the minority people" - apparently meaning the folks who may not agree with his view - and hoped they will feel they got a fair hearing. Us vs. them... It's interesting to watch him work because you never know what he's going to say. He's demanding another consideration for his request for an invocation at the beginning of each meeting - an issue that will be discussed by the group next time, following some legal guidance from attorney Kimberly Hall Barlow. Several members expressed concern about Public Contracts, prevailing wage, etc. Enough did so to place that collection of issues at the top of the heap for discussion. Many members brought up the City of Bell, expressing concern that a Costa Mesa Charter not permit the abuses that happened in Bell. Financial concerns and employee issues - contracts, outsourcing - also ended up high on the list. So, the ball is rolling and I'm encouraged by the progress that was made over the past two meetings. The tough part is ahead and, as the specific issues begin to be discussed at length, we'll see just how cohesive they remain. 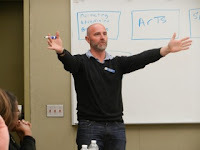 Because Bauermeister and Decker have found their footing, and because the group presently seems comfortable with them providing direction to the process, I'm keeping a positive thought, but understand the politics of this process. There seems to be four or five members firmly in the camp of the current council majority, but we won't know what that means until further down stream. I expect "sides" to coalesce in the weeks to come. That's when we find out how valuable this process will be, and whether the group can work through the different viewpoints and arrive at something resembling consensus.